You will arrive at Delphi at around noon after having taken a scenic drive through mountains and fertile valleys of olive groves and cotton fields and pass traditional towns such as Levadia and Arachova enjoying breathtaking views of the Greek countryside. In the town of Levadia there will be a stop of half an hour for refreshments. 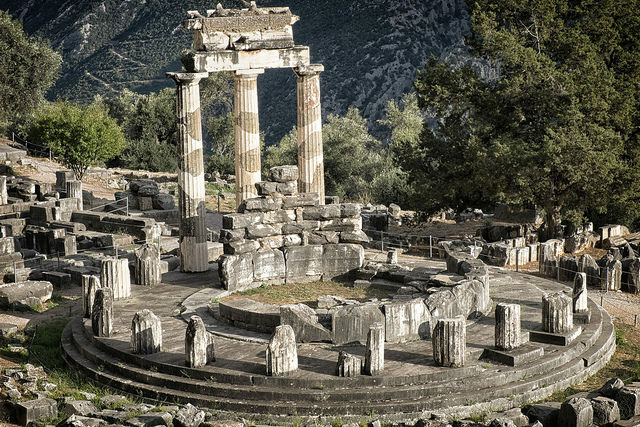 Your professional licensed tour guide will give you a guided tour of the archaeological site and the museum of Delphi. Thus you will be introduced to the history of one of the most significant archaeological sites of all antiquity considered by the ancient Greeks to be the navel of the earth. You will see monuments such as the Athenian Treasury, the Theatre, the Temple of Apollo, the Navel of the Earth, the Sacred Way and many more! In the Museum of Delphi you will admire unique treasures such as the world famous bronze Charioteer, the Naxian Sphinx and the Statue of Antinoos and many other masterpieces of classical Greek art. The tours do not take place on the public Holidays: 25 & 26 December, New Year's Day, Good Friday (before 12:00), Easter Day, May 1st and March 25, the Greek Independence Day.